The 7"-release features a multicolour band-shot (3�"x5" - Pål, Morten and Magne) by William Hames on a white background. 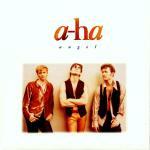 The a-ha-logo is in different shades of orange and red and placed in the upper mid-section of the sleeve, while "Angel" is printed in dark blue letters right below the logo. The reverse is dark beige and features three individual shots, small adverts for the album and video, plus titles printed in small blue letters. The tracks on the 7" are the single edit version of "Angel" (4:06) and the album track "I Call Your Name". The first CD of a two disc limited edition set comes in a two way fold-out digi-pak. The front cover is the same as the 7". Like the "Dark Is The Night" digi-pak, it has space to hold two CDs. The centre of the fold-out digi-pak has a picture of Magne and Pål against a black background. The CD has a black and cream picture of the band and black titles. In the right hand side of the digi-pak there is a cardboard black CD with white titles advertising the other CD which is available separately. The left hand flap of the digi-pak has a picture of Morten on a black background, the right hand flap is dark beige coloured with the track listings for both CDs and small pictures of "Memorial Beach" and "Live In South America". The reverse of the digi-pak is the same as the back of the 7", exempting the pictures of the album and video. It features an "acoustic Instrumental" version of "Angel" (4:05), two album tracks and a live version of "Scoundrel Days" (4:46) taken from the video "Live In South America". The second CD comes in a jewel case and has front and reverse cover similar to the 7". The CD is a picture CD with a black and silver picture of the band and black titles. It features the "Edit" version of "Angel" (4:06) and live versions of "The Sun Always Shines on T.V." (4:53), "I Call Your Name" (4:42) and "Early Morning" (3:40) taken from the "Live In South America" video. There are promotional copies which come with white circular "Promotional copy only not for resale" and rectangular wea records stickers stuck on the case. The cassette single has the same cover as the 7", but has been rotated so that the title reads from bottom to top. The spine of the cassette insert is dark beige coloured with an orangy red a-ha-logo and blue titles. The inside flap is beige coloured with the 3 individual pictures and minuscule pictures of "Memorial Beach" and "Live In South America" again rotated. The black cassette features the same tracks as the 7", one on track on each side. Brazil: This promo only 12" release from 1994 features "Bye Bye Baby" by Madonna plus a-ha's "Angel In The Snow". It comes in a title sleeve. Germany: The 5" CD released in Germany is almost identical to the second CD released in the UK except for the tracks and track listings. The German CD includes the edit version of "Angel", the album version of "I Call Your Name" and the acoustic Instrumental version of "Angel". The actual disc has the same picture as on the second UK CD, but it is paler in colour and more of the picture is missing at the centre of the CD. There is a 1-track promo CD single of "Angel" featuring the album version (4:13). The sleeve of the promo has a dark brown background colour with an angel drawing to the left, which is difficult to see. 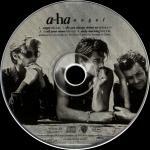 The front features a large red and orange `glowing' a-ha logo (like the one found on the cover of the album "Memorial Beach") and "angel" printed in yellow above. The inner sleeve also has a dark brown background with a drawing of an angel in the centre. Titles are printed in red plus a picture of the cover of "Memorial Beach" is included. The spine is dark brown with light grey text. The CD is of similar design to the cover. The disc is dark brown with the angel drawing left of centre. The a-ha logo is printed across the middle in large orange letters. " angel" and other text is silver.